Some Steam Machine makers are attempting to create small form factor gaming machines powered and priced competitively to the latest generation consoles. Starting at $1,899, Digital Storm's liquid-cooled Bolt II is not one of those. Digital Storm has proven itself capable of creating affordable gaming machines, but for the most part the company has been focused on innovation more than hitting a particular price point. The original Bolt was a testament to their design philosophy — a 3.6 inch-wide powerhouse of a slim PC. They created a custom cooling solution. They made a powerful Nvidia Titan card run reliably on a 500W power supply. They worked some mad voodoo. And now they're at it again with the Bolt II. They're calling it the first small form factor/Steam Machine hybrid gaming PC. The designation is a bit of fluff — all a gaming PC needs to be an official Steam Machine is Valve's approval and a Steam OS partition. It has those, so it gets to use the label. "We (Digital Storm) are not looking to compete with console pricing," said Rajeev Kuruppu, Digital Storm's Director of Product Development. "We're taking aim at the high end of the market, targeting consumers that demand the best possible gaming experience and who are looking for a PC capable of playing any title on their new 4K display." So yeah, it's a high end, small form factor gaming PC. Only it's more impressive than that. For one, Digital Storm's engineers have compartmentalized the enclosure, eliminating the component accessibility issues common to small form factor machines. The video card, storage drives, optical drives and cooling systems are housed in removable compartments for ease of maintenance and upgrade. The case has been engineered with optimal cooling in mind, with perforated air vents over the hottest bits. The system also comes fitted with Digital Storm's proprietary HydroLux control board, which monitors the unit's temperature in real time, balancing thermals and noise on the fly. It's an impressive little box of computer, and it's not cheap. Here's a sample Bolt II configuration sent to us by Digital Storm. 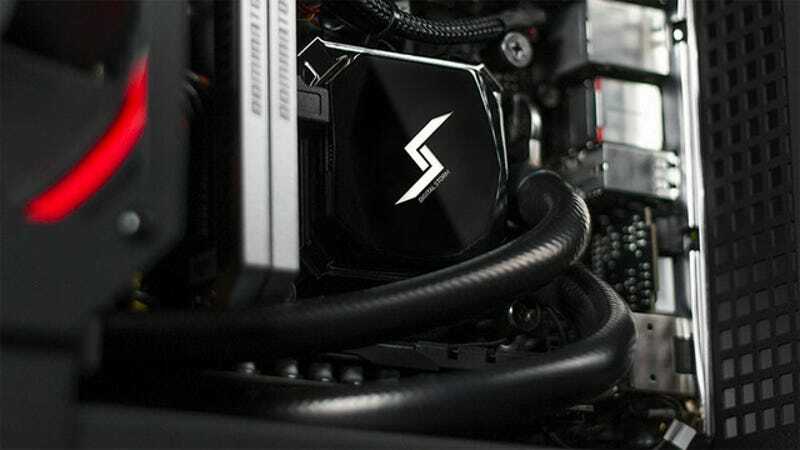 The Digital Storm Bolt II is a high end, small form factor gaming PC. It's also a Steam Machine, by virtue of Valve's approval to call it such and a Steam OS partition on the hard drive. Is that all it takes? Pretty much. Here come the Steam Machines. The Bolt II will go on sale later this month at Digital Storm's website.